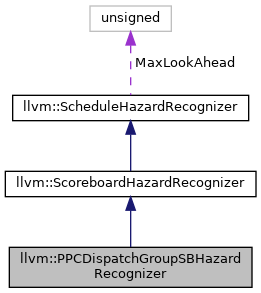 PPCDispatchGroupSBHazardRecognizer - This class implements a scoreboard-based hazard recognizer for PPC ooo processors with dispatch-group hazards. Definition at line 25 of file PPCHazardRecognizers.h. Definition at line 34 of file PPCHazardRecognizers.h. References AdvanceCycle(), EmitInstruction(), EmitNoop(), getHazardType(), PreEmitNoops(), RecedeCycle(), Reset(), and ShouldPreferAnother(). Definition at line 206 of file PPCHazardRecognizers.cpp. Definition at line 175 of file PPCHazardRecognizers.cpp. References llvm::dbgs(), llvm::ScoreboardHazardRecognizer::EmitInstruction(), llvm::MCInstrDesc::isBranch(), and LLVM_DEBUG. Definition at line 220 of file PPCHazardRecognizers.cpp. References llvm::PPC::DIR_PWR6, llvm::PPC::DIR_PWR7, llvm::PPC::DIR_PWR8, and llvm::PPC::DIR_PWR9. Definition at line 140 of file PPCHazardRecognizers.cpp. Definition at line 156 of file PPCHazardRecognizers.cpp. References llvm::PPC::DIR_PWR6, llvm::PPC::DIR_PWR7, llvm::PPC::DIR_PWR8, llvm::PPC::DIR_PWR9, and llvm::ScheduleHazardRecognizer::PreEmitNoops(). Definition at line 210 of file PPCHazardRecognizers.cpp. Definition at line 214 of file PPCHazardRecognizers.cpp. Definition at line 147 of file PPCHazardRecognizers.cpp.